My Dad and I had a fantastic Jazz Night Out when we saw the Joshua Breakstone Trio play Natalie’s on Tuesday the 15th. Joined by Roger Hines on bass and Reggie Jackson on drums, the veteran guitarist and New Jersey native led the band in one long set that was a deep dive into classic jazz material. The set opened with a nimble take on Pat Martino’s “Lean Years,” where Breakstone set the tone for the evening with a beautiful solo that showcased his fluid style, and Hines and Jackson followed suit, especially the drummer’s confident attack on his breaks. Lee Morgan’s “The Witch Doctor,” a tribute to his bandleader Art Blakey as Breakstone explained, had an authoritative shuffle that put a different perspective on the hard bop classic. Dizzy Gillespie’s “And Then She Stopped” changed up the groove with a relaxed Latin feel, but the leader’s technical lines did not let up! “A Jamais,” a Breakstone original and the title track of his 2004 album, had the warm vibe of quintessentially swinging jazz guitar. It opened with an earnest and lyrical unaccompanied solo by Breakstone, and Hines took the first solo of the full tune with a sprightly passage. Bud Powell’s “Tempus Fugit” rounded out the night with cooking bebop that was equal parts graceful and explosive, with more excellent solos from the trio. This was a wonderful display of classic jazz guitar for the modern age – see Breakstone on tour if you get the chance! Friday & Saturday, August 18th & 19th (11am – 11pm): 7th Annual Columbus Food Truck Festival at The Scioto Mile, Downtown. This annual celebration of the burgeoning street food scene in Central Ohio has relocated this year for two great days at Bicentennial Park and Washington Boulevard on the Scioto Mile downtown. While the festival’s two stages host a wide variety of musical entertainment, there are certainly highlights for local jazz fans. On Friday at 7pm on the Bicentennial Park Stage, groove masters fo/mo/deep will play their funky and passionate brand of 70’s-leaning jazz with a lineup of Ron Holmes on bass, André Scott on drums, Kevin Jones on keyboards and Joe Loyer on saxophone. On Saturday at 12:15pm, The Liz Woolley Band opens Day 2 of the Bicentennial Park Stage with its fresh and vibrant take on jazz-pop, and Anna & the Consequences hit the Washington Boulevard Stage at 2:30pm with their family friendly jazzy torch blues, as Anna Paolucci’s vocals will be accompanied by Caleb Hutslar on piano, Tom Davis on guitar, Andy Kuss on upright bass, and Tony McClung on drums. Here’s hoping the weather allows another great weekend of free outdoor music downtown, this time with 50 to 60 food trucks in tow! 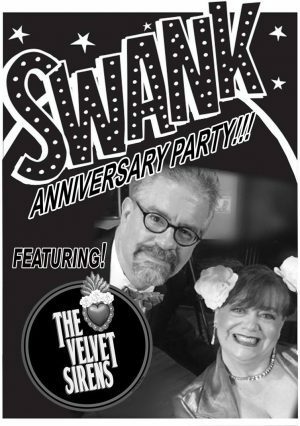 On Saturday, August 19, 2017, The Velvet Sirens will be performing at the 5th Anniversary of Swank Columbus. Swank is a monthly cocktail dance party hosted every 3rd Saturday from 5 to 9pm by DJ Arlette (Arlette Roeper) where you can dress up if you want to! There’s plenty of room for dancing at The Brewery District’s Big Room Bar! Swing by and enjoy great Big Band, Swing, and Exotica spun on Vinyl! Free Admission! Saturday, August 19th (8 – 11pm): The Broadstreet Lineup at The Idle-A-While House Restaurant. This Columbus funk/jazz outfit recently expanded to a six-piece lineup and you can be among the first to see their revamped take on a wide variety of funky, danceable tunes by artists like Sly and the Family Stone, Gil Scott-Heron, Donny Hathaway, Bobby Caldwell, War, and The Headhunters. The new sextet consists of Zach Olah (vocals/trumpet), Tom Davis (guitar/vocals), Nate Shaw (keyboards/vocals), Seth Daily (drums), Jason Miles (Fender bass), and Alex Burgoyne (sax/vocals/percussion). As always, there is no cover at the Idle-A-While, but reservations are strongly encouraged and can be made here.